(CNN) -- Wide green expanses of farmland outside a picturesque northern French village hide memories of a World War I battle in which thousands of British and Australian troops were killed or wounded on a single night. 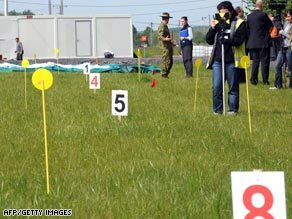 Australian soldiers and forensic experts work on the field in Fromelles, France, on Monday. The Australian military still considers it among the worst in its history. On July 19, 1916, two divisions of Allied infantry were ordered to attack a strongly fortified German position known as the Sugar Loaf. The defenders knew the British and the Australians were coming; the terrain favored the Germans. As the British and the newly arrived Australians charged into battle, the Germans opened fire. By morning, about 2,300 British and Australian soldiers were dead. About 5,000 others were wounded. There were so many dead that many were never found or identified, never given a proper burial. Fromelles has no neat rows of crosses amid the poppies like those immortalized in Canadian Maj. John McCrae's poem "In Flanders Field," about a battle that took place the prior year and 21 miles north of Fromelles. There has long been speculation that the Germans recovered hundreds of bodies and put them into mass graves, not forgotten, but anonymous. Last year, preliminary digs commissioned by the Australian government located five mass graves near the site of the battle. The Commonwealth War Graves Commission estimates there are between 225 and 400 bodies in the pits. "It's the largest military find since the end of the Second World War," said the agency's spokesman, Peter Francis. "I have been on the commission almost 11 years and it's like nothing I have ever experienced. I have never known anything to have this sort of numbers of possible remains." On Tuesday, the commission will begin a 15-month project to disinter the bodies, attempt to identify them, and rebury them in individual graves in a new cemetery on the site. The resulting graveyard will be the first new one consecrated by the commission for almost 50 years, Francis told CNN by phone. The recovery phase is expected to last until September, Francis explained. Simultaneously, work will begin on the new cemetery, to be known as Pheasant Wood, after the site. That's due to be finished by December. The British and Australian governments have asked people who think their relatives may have died at the site to get in touch, Francis said. It was not immediately clear how many had done so, if any. Experts will try to take DNA samples, the commission said on its Web site, but it is not clear if they will be sufficient to identify bodies "which have lain undisturbed for more than 90 years." A pilot study "will establish if sufficient DNA survives in adequate condition for successful extraction and to allow DNA comparisons to be made." Regardless of the DNA results, the commission said, "A careful cross-referencing of casualty records means that we have a pool of possible identities for the men buried in the pits." The remains will be reburied in individual graves early next year, according to commission plans, and the cemetery will be dedicated on July 19, 2010 -- the 94th anniversary of the battle. The work of exhuming the bodies will be carried out by Oxford Archaeology, "a multinational team of field archaeologists, heritage management, environmental and finds specialists and survey and computing personnel," according to the commission, which assigned the contract. The bodies of more than 165,000 Commonwealth soldiers killed on the Western Front during the First World War are still missing, the commission says. The commission is a non-profit organization founded in 1917 that commemorates the dead of both world wars from the British Commonwealth.